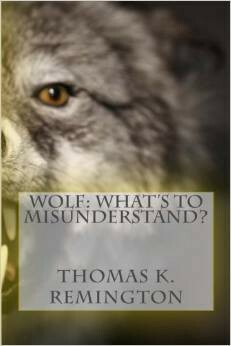 It was January 21, 2009 when I wrote: “….for hunting wolves, should the day ever come to pass, will be inadequate to control wolf populations.” I was no prophet at that time. My conclusions were based on scores of studies, real life accounts, books, research and common sense. It first must be said that many, if not all, of the problems Idaho has had and continue to have with wolf management, can be easily attributed to the fact that the Idaho Department of Fish and Game (IDFG) officials, along with their partners in crime at the U.S. Fish and Wildlife Service (USFWS), ignored warnings from those who knew what the future would hold with introduced wolves. They ignored historical facts. Aside from some far fetched dream of bringing those who introduced wolves to justice, that fact that wolves were dumped into the Northern Rockies is history and little can be done now to change that. How to manage those wolves, as predicted, is becoming a problem……well, becoming a problem to those that have to deal with the varmints. I guess the question should be asked if IDFG is in the middle of a learning curve on wolf management or are they playing wolf protection games in attempts to play both sides of the aisle? Idaho citizens were told that wolves would be considered “recovered” as a species when the state had about 100-150 wolves, depending on the number of breeding pairs. Once that milestone was reached, another failed promise was that wolf “management” would be turned over to the state. One thousand wolves later, the state is still trying to gain authority to take over management. It was part of my article that I wrote in 2009, that I explained that the IDFG had decided to go ahead with plans on how to conduct a wolf hunt, if and when the day ever came they could do that. 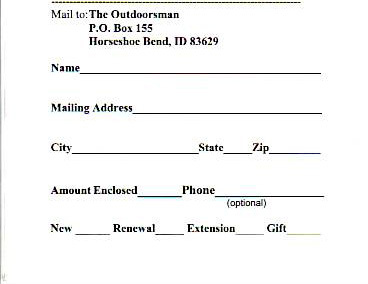 In that same article I wrote in depth about efforts by George Dovel, editor of the Outdoorsman, to stop the runaway IDFG who, according to his information, had illegally devised wolf management plans, including the plans to formulate a hunting season without Idaho legislative approval as is mandated in Idaho Code. The illegal activities have continued, unchecked, and IDFG made their plans and laid out guidelines to administer a wolf hunt. The rules of the hunt were simple: sell as many tags as they could (a money-making scheme) and then restrict hunters to a rifle, a bow or a muzzleloader, nothing else. Anyone with any knowledge of wolves would know that such a hunt would do nothing to “manage” the overgrown wolf packs. Again, one must ask the question as to whether IDFG knew this kind of hunt would do nothing to control wolf population numbers, were they protecting the wolves in their own way by pretending to placate the sportsmen, or is IDFG ignorant of facts and are innocently in the midst of a learning experience? One in which it seems they were not willing to listen to knowledgeable people about wolves and wolf habits. Me and many others knew this kind of wolf hunt would be a waste of time, at least as it pertained to wolf population reductions or even population maintenance. Will N. Graves, author of Wolves in Russia: Anxiety Through the Ages, learned through his research in Russia about wolves, that every method imaginable to control wolf populations were ineffective, in part because Russian authorities refused or did not have the resources to sustain a continuous wolf control program. The most successful method of destroying coyotes, wolves and other predatory animals is by the organization of systematic hunting by paid hunters, receiving no bounties and working under government control. This policy is giving excellent results in the United States, as will be shown presently. Any rational system of wild-life protection must take into account the control of the predatory species of mammals and birds. And while the complete extermination of such predatory species is not possible, desirable, or necessary, a degree of control must be exercised to prevent such an increase in numbers as would affect the abundance of the non-predatory species. In the treatment of predatory animals it is necessary to determine whether the species concerned are responsible for more harm than good in a particular region. Some might argue about the effectiveness of a bounty system but that’s another debate. During the times of this debate about effective ways to control wolf population, I spent several hours researching historic documents in hopes of finding accounts of how wolves were dealt with worldwide. When I say “dealt with” I’m referring to the need of people to reduce wolf populations for reasons of lessening livestock depredation, protecting people and property from attacks and spreading of diseases. The result of my research culminated in a multi-part series, To Catch a Wolf. For your convenience I took the time to put the parts together into one downloadable publication. It shouldn’t take anyone very long to discover that wolves cannot be managed as a big game species. IDFG and Governor Otter, lay claim that Idaho will manage gray wolves just like any other big game species. And therein lies a huge problem. Every historic account about wolves laments the need to control wolves and they have shared their frustrations and the difficulties they encountered in order to do that. The notion that a person would have to pay the government money to help in undertaking predator control is absurd. Initially, IDFG, sent their sportsmen into the field with a rifle, or a bow, or a muzzleloader, to control wolves. I and many others knew two things: 1.) The rules of the hunt were such that too few wolves would be taken to amount to anything that would resemble wolf control, and 2.) 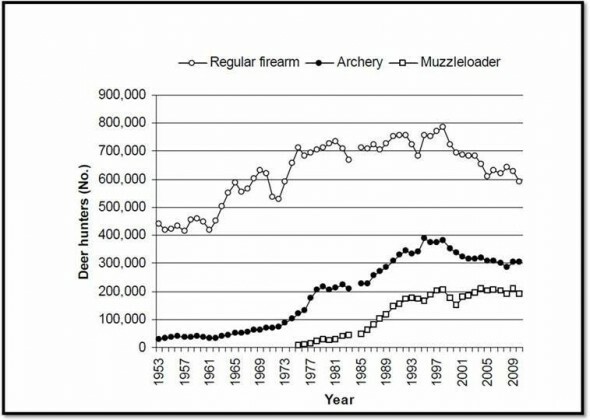 The first year would probably see the best results for a couple of reasons; initial excitement of killing wolves and wolves had not yet learned to stay away from humans with guns and bows. This would result in a continued growth of wolves and a reduction, over time, of wolf harvest. In time, IDFG was willing to concede that they were not providing the sportsmen with enough tools to harvest more wolves. They loosened their grip and in time even allowed for trapping. Both hunting and trapping, still being conducted with the ignorant notion that wolves can be treated as a big game species, still were not getting the results needed. In some areas, like the Lolo area, wolves had reduced the elk herd there from 16,000 to 2,000. Efforts to get wolf hunters and trappers into that region provided no desirable results. Believe it or not, IDFG was forced to hire aircraft to fly into that region and shoot wolves to save the elk population. Isn’t this insanity? So, what is IDFG doing about reducing wolf numbers necessary to save elk, moose, deer and other species of prey that helps to make for a healthy ecosystem? Statistics seem to be showing that not enough is being done and the present plans, illegal or not, are not working. 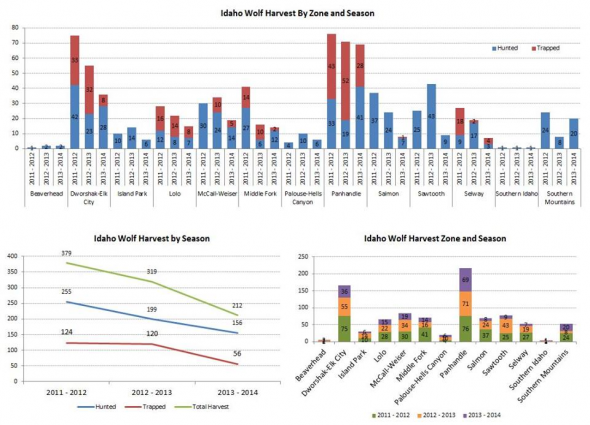 Below are some graphs that show the last three seasons of wolf hunting and trapping in Idaho. The charts were sent to me by Scott Rockholm of Rockholm Media and Save Western Wildlife. What I see that is very telling is that over the last 3 wolf hunting/trapping seasons, the total take of wolves has shrunk. When it is considered that restrictions for hunting wolves have been eased and trapping added, any hope of reducing wolf populations has vanished. This is a failure of a plan and needs to be changed. The attached graphic illustrates the failed notion, that we will ever “Manage” wolf populations. This visual aid will show that not only are we paying department personnel to know this, but we are paying them in spite of their incompetence. We have calculated that successful wolf hunters/trappers have spent at least $1000.00 in expenses, and an enormous amount of time, just to hunt/trap one wolf. The current narrative, from game agencies, to hunting organizations, is that we as hunters and trappers can continue doing business as usual. We couldn’t be more opposed to this thinking. Wolf populations are growing exponentially, and at the current rate, and diminishing interests of hunters/trappers, we believe that we will never stop the decimation of our wildlife. We need to do something different, and we need to do it now. Wolf hunting and trapping need to be continuous, with open season year around for both hunting and trapping, with the addition of other measures, such as aerial gunning, bounties, and poisons specifically targeted to Canids. Canada has proven these methods to be the only means to control wolf populations. Once again, Outcome Based Education, political bias and perpetuated myths are on display in Maine. 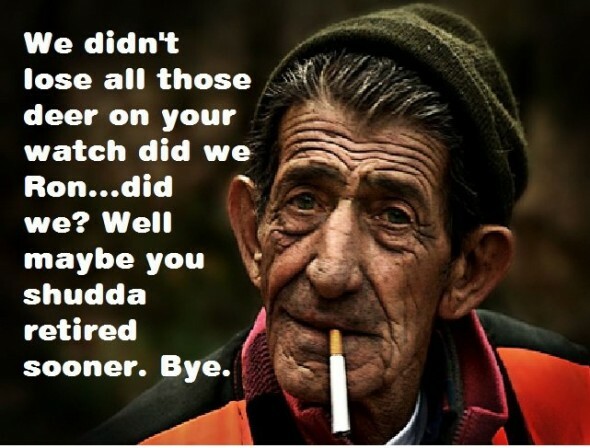 A retired U.S. Fish and Wildlife biologist and a Maine Department of Inland Fisheries and Wildlife biologist, says that politicians are the cause of Maine’s depleted(ing) deer herd, not coyotes. 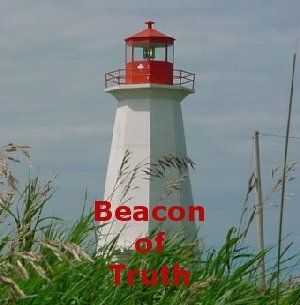 Politicians are to blame for many things and readers know I would be the last in line to stand up for one unless I knew them personally and could trust them. As far as whether politicians are the sole blame for Maine’s vanishing deer herd, I don’t think, as much as I would like to, I could put all the blame on them. The author was a wildlife biologist and worked for the Maine Department of Inland Fisheries and Wildlife (MDIFW), so I doubt he would dare place any of the blame for a terrible deer management execution on his “brotherhood” at MDIFW. Getting beyond the political bias and nonsense, let’s examine a few things that the retired biologist had to say. Since the early 1900s, expensive and barbaric coyote bounties have failed miserably in western states, but that knowledge carries no weight in Augusta. History is full of accounts of how “barbaric bounties” very effectively controlled predator populations. Maybe the author needed to rewind his history clock a few more years to discover that….or maybe the seeming failure was intentional. One has to simply reread many of the journals and accounts from years ago in the West to learn what actually happened. A favorite account of mine is that of C. Gordon Hewitt. It seems counterintuitive, but the war on coyotes has actually increased their numbers and breeding range. The Colorado Division of Wildlife reports that coyotes are more numerous today than when the state was first settled by trappers. Colorado and other western states no longer waste taxpayer money on futile coyote control programs. There exists no scientific evidence that killing coyotes causes them to automatically breed more of themselves. There are just too many factors that come into play when examining reproductive habits of any wild animal. And is the author of this opinion piece actually suggesting here that all those coyotes now in Colorado are solely to blame on hunters and trappers? Once again, a reading and studying of the history of settling the West shows that aside from certain pockets, this nirvana of the West was not so Disneyesque as many would like to believe. Man’s expansion created a vast habitat to support coyotes and all other wildlife. In time, the implementation of the North American Model for Wildlife Conservation allowed for the growth and health of our wildlife systems. The retired biologist intimates that Maine plans to implement a one year program to kill coyotes, saying it wouldn’t be effective. Agreed, and I know of no honest person who has indicated that it would. I happen to know explicitly that both MDIFW Commissioner Woodcock and Governor LePage have been told and I believe understand that predator control is an ongoing part of wildlife management and this should have been taking place years ago. The MDIFW fell flat on their faces in this regard. The article shows us the author’s real colors when he begins his rant about how the Maine politicians failed because they did not steal land rights away from American taxpayers. The crying and gnashing of teeth is about the State Legislature failing to tell landowners they can’t use the resources on their own land; an unconstitutional land grab straight from the pages of the United Nations Agenda 21 program, whose goal it is to take all land and resources worldwide and forbid you and I from owning or having access to any of it, saving it instead for them. I’m all for protecting our wildlife, but never at the expense of man’s life, liberty and the pursuit of happiness. There are better ways than forceful takeovers. If you remain unconvinced that lack of winter shelter is the primary reason northern Maine supports few deer, please consider this: Minnesota and Michigan deer herds are much healthier than Maine’s. Minnesota and Michigan winters are as difficult as Maine’s. Deer in both of those states must also avoid being eaten by coyotes and wolves. So the logical question LePage, Woodcock, Martin and deer hunters should ask is this: What are Minnesota and Michigan doing differently to maintain healthy deer populations? The answer: Both states prioritize protecting deer wintering areas through land purchases, conservation easements and regulating excessive timber harvests. 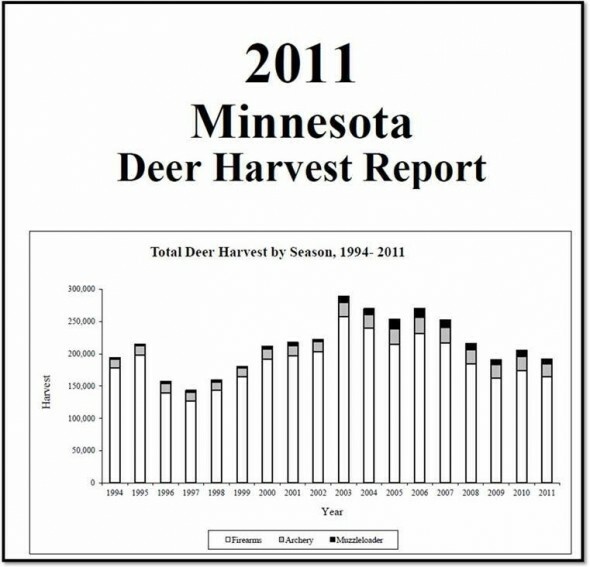 The proof is in the pudding they say, and with the help of a reader, we have been able to provide a couple of graphs that show that since the late 1990s and early 2000s, both Minnesota and Michigan have seriously reduced deer harvest numbers, dropping over 30% and more. You don’t suppose that one of the reasons that Minnesota and Michigan have a declining harvest of deer, an indication of a declining deer population, has anything at all to do with the years of over protecting predators and now the results of that over protection are showing up? In addition, I have yet to get anyone that pretends to have all the answers explain to me why, if there are no more deer wintering areas left in Maine to support more deer, the ones we have are not being used? It appears that the basis for the author’s opinion piece in the paper is mostly wrapped around his dislike of Gov. LePage and his republican administration, while at the same time blaming politicians in general for a deer demise, the fate of which was left in the hands of the Department of Inland Fisheries and Wildlife; a department that the biologist was an employee of. Surely we couldn’t expect someone to point a finger at their brotherhood of hoodwinked biologists….or even perhaps at themselves. In my selfish gloating I am proud to state: “I told you so!“. Over three years ago I predicted that with the wolf hunt plans being discussed for Montana and Idaho, the fish and game departments would fail miserably in any quest to control wolf populations. We find out today that as Montana closes this year’s wolf hunting season, they failed to reach the quota of killing 220 wolves. What they recorded was 162 wolves tagged, even after extending the season. This equates to a success rate of less than 1% according to KFBB.com. And of course the Montana Fish, Wildlife and Parks (MFWP) have all the excuses why the quota wasn’t met. Officials say the hunt has been slow for a variety of reasons. Wolves naturally try to avoid humans and they are so widespread across the region. With the lack of snow, they can be harder to track. While these excuses hold some truth, hunters are restricted in tools necessary to kill wolves, and they’ll never accomplish the task of “control” this way. Readers should be reminded that last spring, Idaho Department of Fish and Game (IDFG) put helicopters in the sky to kill wolves in the Lolo Region. Lack of snow made spotting wolves difficult and officials only killed 5 wolves. C. Gordon Hewitt in, “The Conservation of the Wild Life of Canada“, over one hundred years ago told us what was the most effectual way to kill coyotes and wolves. The problem is by no means a local one, nor even a provincial one; it is both interprovincial and international in character, and it is only by organization along these lines that ultimate success will be obtained. What we need is co-operation among all concerned: individuals, live-stock organizations, and governments; all of them should contribute to the funds that are needed to carry out the work after a broad policy has been formulated. Will Graves, author of “Wolves in Russia: Anxiety Through the Ages“, gave his readers a laundry list of all the methods, tactics and tools the Russian Government used in an attempt to control wolf populations. 1. Drive Hunting with Flags – Large squares of cloth tied a couple feet apart and strung by rope was used to force wolves to specified areas where hunters waited in ambush. 4. Call Hunting – Use of man made calls that imitate sounds that will lure wolves. 5. Scouting for and Finding Dens – This is a method used by natives in Alaska and other parts of the world. Wolves often return to the same denning areas each year. Hunters would locate these dens, remove the cubs and kill them. While employment of all these methods yielded good results, Graves points out to readers that without a sustained wolf control effort, problems would persist. Dealing with wolves worldwide over the years has always been a struggle. In my series “To Catch a Wolf“, there are numerous accounts of the ways in which people crafted tools and tactics to kill wolves. So, what is it that wildlife officials expect? They themselves, with the assistance of helicopters can’t kill enough wolves to make it worth the effort. We have read often of efforts by game biologists trying to trap and collar/tag wolves and can’t get the job done. Yet even with that knowledge and their choice not to seek historical facts on the difficulties in controlling wolves, they somehow think a hunter, willing to contribute a few dollars, is going to take his gun and be successful in killing him a wolf? I remind readers of the less than 1% success rate. As long as states insist that wolves and coyotes will be “big game” animals, hunted for sport by one man and one gun, citizens can expect no changes in the reduction of wolf/human encounters or any increases of game animals in areas where wolves have destroyed them. One has to question the real goals behind wolf hunting. It certainly doesn’t appear to be population reduction to protect private property and salvage other game animals, such as deer, elk and moose. Perhaps officials are waiting for Nature to balance itself out! Yeah, that must be what it is. Now, how does that work?